CPA19/01 by the City of Topeka amending the text and map of the City of Topeka’s Comprehensive Plan updating the Central Park Neighborhood Plan. The area affected by the amendment is bounded by SW Washburn Avenue to the west, SW Huntoon and SW 13th Streets to the north, SW Topeka Boulevard to the east and SW 17th Street to the south. 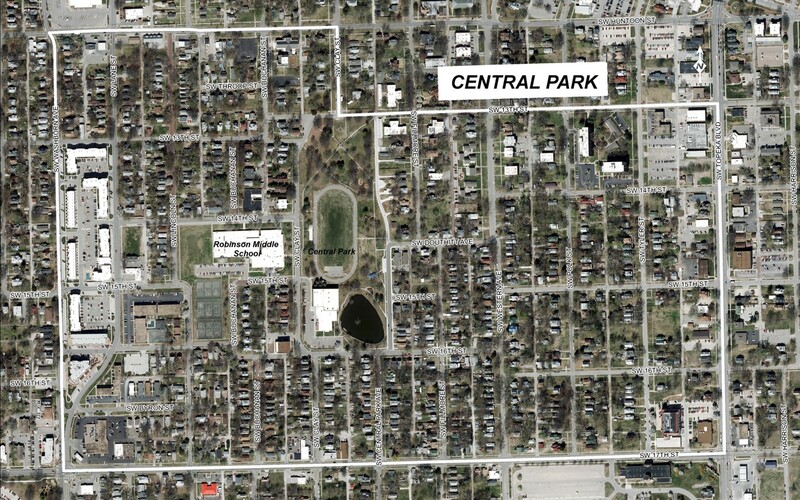 Based on an application by the Central Park Neighborhood Association, the Central Park Neighborhood has been chosen to receive planning and funding assistance from the City of Topeka in 2019-2021. The planning process for the update to the Central Park Neighborhood Plan includes a kick off at 6:30pm on February 21, 2019. The meeting was hosted by the Central Park NIA at the Central Park Community Center at 1534 SW Clay Street and covered the current conditions and trends. It also included a time for all to brainstorm on where Central Park will be in the next 10 years. The Plan Review Committee has met on March 21 and April 18. Documents from both meetings are below. For additional information about the update to the Central Park Neighborhood, contact Dan Warner by email, or call him at 785.368.3006. Check back periodically for updates to this website throughout the spring and summer.